Jim Tafel and Tony Dowe announced their 2006 Rolex GT Series programme at the end of November – Porsches for Jim Tafel / Andrew Davis, Robin Liddell / Wolf Henzler and Charles Espenlaub / Eric Lux. Joining Liddell and Henzler for the Rolex 24 will be Johannes van Overbeek. His regular team, Flying Lizard Motorsports, opted to miss the Rolex 24 this year, and van Overbeek has found a very competitive drive, in the #72 Tafel Racing Porsche 997.
van Overbeek finished second in class, third overall, in the 2004 Rolex 24 – one spot behind the Orbit Porsche, which had Robin Liddell sharing the driving. 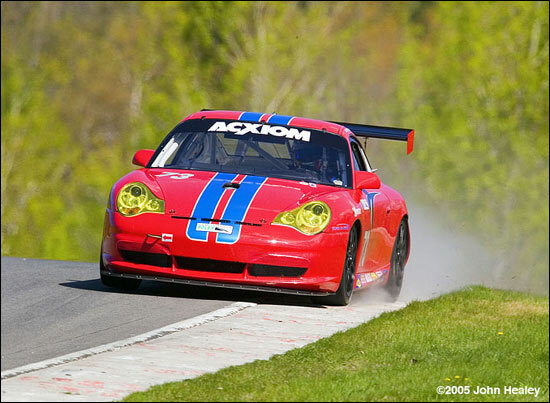 He was also third overall in 2003, driving the Rennwerks Porsche. Jim Tafel and Andrew Davis will split up for the Rolex 24. Joining Tafel in the #73 Porsche will be Dr. C. Michael Cawley, Shawn Price, and Chad McQueen. Shawn Price was a class winner at the Rolex 24 in 2005, with Wolf Henzler among his partners in the Farnbacher Porsche. Joining Davis in the #74 Tafel Racing Porsche will be Charles Espenlaub, Eric Lux and Graham Rahal. With Tony Dowe masterminding operations, Tafel Racing is sure to be in contention for GT Class honours later this month.